The story of the spat-upon-vet might be an ingrained part of the American popular history of the Vietnam era, but more recent research has brought its veracity into question. Based on a lack of evidence of the mistreatment of returning Vietnam vets, scholars have framed the story as a part of a narrative strategy created by Americans who resisted the political and cultural upheavals of 1960s to illustrate their revulsion at how their nation had changed. The spitting was evidence for a “stab-in-the-back”- style theory that blamed America’s loss in Vietnam on the undermining of traditional values, notably ones around gender, during the Vietnam era. This cultural coping mechanism has important political ramifications, allowing conservatives to paint the anti-war movement as inherently unpatriotic. No analysis of the myth of the spat-upon vet would be complete without at least a mention of the painful irony that it is the American state, especially under Republican leadership, that has shown utmost disrespect for Vietnam vets with cuts to the services to which they are entitled. The statistics concerning homeless veterans are nothing less than shocking: almost a third of the male homeless population, and quarter of the overall homeless population, are veterans. Almost half of those are Vietnam veterans, meaning men who should be enjoying a comfortable retirement are out on the street. A strong identification with the men and women whom America asks to fight its wars has been a hallmark of GBT’s work since the 1990 Gulf War, when Trudeau focused on addressing soldiers’ daily struggles and their attempts to terms with the physical and emotional scars that war inflicted upon them. The stories of B.D., Ray, Mel, and Toggle have drawn attention to a critical gap in American political culture: the space between the nation’s valorization of its soldiers and its failure to properly provide and care for those people when wars end. In this post, I’m going to use Garry Trudeau’s first instance of writing about a Vietnam veteran as evidence that anti-war voices were able to sharply criticize American aggression in Vietnam without attacking the soldiers who fought the war; in fact, Trudeau displayed a strong sense of empathy for Vietnam veterans from the first time he wrote about them. As I’ve written previously, an important shift in how Garry Trudeau wrote about American soldiers came as he began to write directly about the war. In a series of strips about B.D.’s ROTC training, Trudeau portrayed our hero – and by extension, the American military – as a psychopathic killer. However, GBT’s portrayal of the American military shifted when B.D. got to Vietnam: Trudeau largely abandoned dark satire for an approach that couched his criticism of the war in a more lighthearted style of humour. When B.D. was in-country, nobody died; the only injury of note was B.D. cutting himself on a beer can. 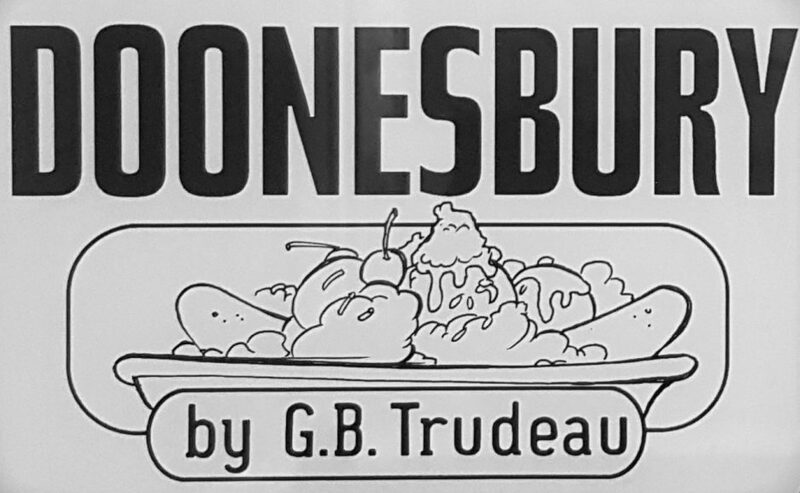 Trudeau did return to a darker style with his strips about the Heartless Air Pirates, the airmen who dropped the bombs that killed millions Vietnamese and Cambodians, but even then, the Heartless Air Pirates were more clueless cogs in a machine than they were evil “baby-killers.” It’s clear that the more GBT wrote about the war, the more he understood that the real bad guys weren’t the individual soldiers, they were the generals and politicians who sent them to a cruel and ultimately futile war. Skip only appeared in a handful of strips, most of which focused on his readjustment to life in a country that had changed in profound ways while he was interned. Like Steve Rogers, Captain America’s alter-ego, Skip is a man out of his time: he looks forward to enjoying long-gone cultural touchstones such as Life and The Ed Sullivan Show. Skip was easily, if sometimes clumsily, embraced by the Walden crew. More importantly, he was respected, and not only by his fellow vet B.D. When Nicole affectionately addresses him as “soldier” as they discuss feminism, she is telling us that even though she was opposed to the war, she can still see her new friend as someone who served his country with honour. While Skip might have played a similar wartime role to that of the Heartless Air Pirates (almost all American POWs were airmen), unlike the Heartless Air Pirates who were, if not heartless, painfully oblivious to the death and destruction they cause, Skip is an empathetic character who seems able to step outside of himself and see the world through the eyes of his fellow human beings. GBT fervently opposed the war, and used his voice to draw attention to the crimes his country was perpetrating against the people of southeast Asia. Yet at the same time, even in the immediate aftermath of America’s Vietnam involvement, he was was able to understand that the individual soldiers who fought the war were caught up in something much bigger than themselves and deserved to be seen as individuals with their own struggles, and the capacity to grow and change.